The PW800 is the preferred choice because it integrates its load cells within the existing forks. Other designs incorporate false forks thereby increasing the fork height, width, pallet truck weight and reducing accuracy. The PW800 uses load cells which are certified by the U.S. National Institute of Standards and Technologies to provide +/- 0.1% accuracy. The industry’s highest standard capacity at 5,000 x 1 lb and lowest profile forks at 2.9 inches guarantees you can accurately and safely lift any conventional pallet. 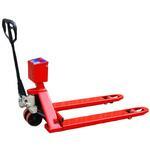 The PW800™ is the preferred choice for Pallet Truck Scales because it integrates load cells within the existing forks. These load cells offer the industry’s highest standard capacity at 5,000 x 1lb (2,500 x 0.5kg), with an accuracy of ±0.1%, combined with the lowest profile forks at 2.9” (74mm). The scale runs on nine D-Sized Alkaline or NiCad rechargeable batteries for up to 75 hours. The 0.8” (20mm) LED display and membrane keypad provide increased visibility and functions for gross/net/tare and parts counting. All electronics are shock mounted and contained in a rugged and durable enclosure. 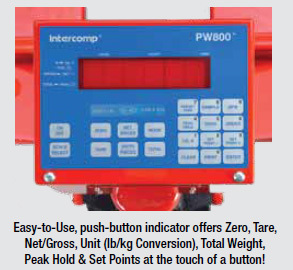 Easy-to-Use, push-button indicator offers Zero, Tare, Net/Gross, Unit (lb/kg Conversion), Total Weight, Peak Hold & Set Points at the touch of a button! Virtually any production environment relies upon pallet trucks as an economical means of transporting goods in and around tight locations. Now let Intercomp provide you with another cost effective weigh on the go solution – the PW800 Pallet Truck Scale. 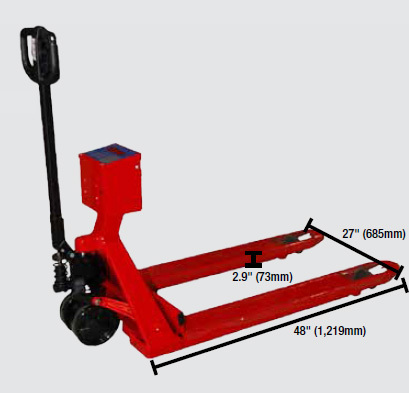 As the world’s largest manufacturer of pallet truck scales, we offer the widest range of sizes and accessories for weighing and counting almost all types and sizes of pallets. Intrinsically safe units are available for explosive environments. The unit maximizes run time by providing up to fifty hours of continuous use via D size commercially available rechargeable or alkaline batteries for easy and low cost replacement. Weights are clearly seen on a 0.8 inch high LED display while the membrane keypad provides functions for gross/net/tare as well as parts counting. All electronics are shock mounted and contained in a rugged durable enclosure. Standard fork sizes are 27 x 48 and 21 x 48 inches/ 685 x 1219 and 533 x 1219 mm.